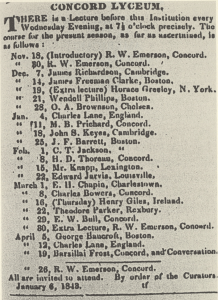 For a complete directory for all of Thoreau’s lectures, see Appendix B from Bradley P. Dean and Ronald Wesley Hoag’s Thoreau’s Lectures After Walden: An Annotated Calendar, which lists all seventy-five lectures in chronological order, with titles and the location of each delivery. For an introduction by Dean and Hoag to Thoreau’s lectures given before the publication of Walden, see this introduction. For an introduction to the lectures delivered after the publication of Walden, see this introduction also written by Dean and Hoag. These works, Thoreau’s Lectures Before Walden: An Annotated Calendar and Thoreau’s Lectures After Walden: An Annotated Calendar have been reprinted with permission of the editor, Joel Myerson.